The Bulldog Track is probably the best option for a real off-the-beaten-track jungle adventure in Papua New Guinea today. It features diverse environments, superb wildlife, history and grass-roots PNG. 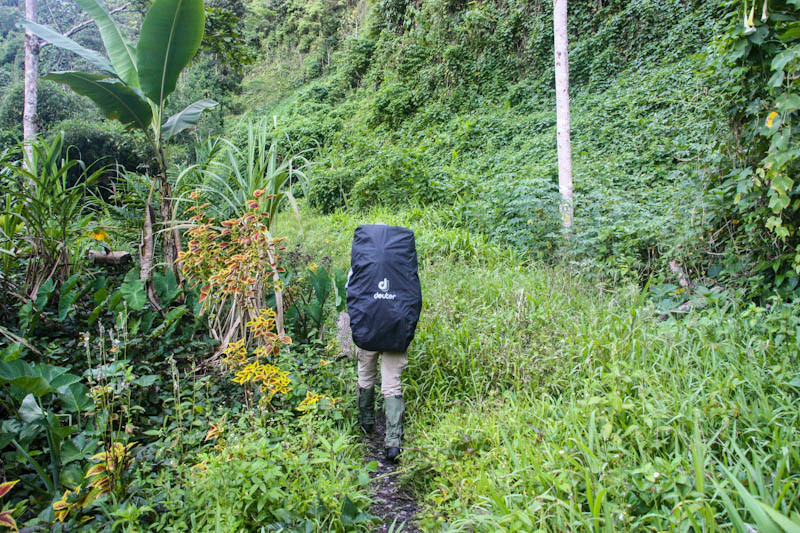 It’s a great walk in either direction through a whole transect of Papuan cultures and environments from chilly highlands to the coastal swamps and rivers of the spectacular Lakekamu Basin. You will cross countless rivers and bash your way through thick, wild jungle. You will meet lovely people who have hardly (or never) seen a ‘whiteman’ before and discover the big hearts of PNG’s natives. The route largely follows the gravity defying, World-War II built, Bulldog Road. A vital supply line for ANZAC soldiers fighting the Japanese in the Bulolo area between Wau and Lae. Conditions on the Bulldog Track were just as difficult as on the more famous Kokoda Track some 200km to the south-east. See an interesting veteran’s account here. For a full account on the road’s history check out chapter 4 of “Australian Army logistics 1943-1945”, downloadable from UNSW Australia here. Originally, the Australian military forces used the Bulldog Track supply line via Kudjeru, also known as the “Donkey Track”. An ancient path across the Owen Stanley ranges that was already traditionally used by the locals. With rising demand for supplies and an acute lack of aircrafts able to service the Wau airstrip it was decided to build a vehicular road along the Bulldog-to-Wau route. Due to the extremely steep ridges the road diverges from the original track near Yanina and crosses the range at an even higher altitude, but with less steep gradients, at the Eccelestone Saddle and leads on to Wau through the Hidden Valley. The ravages of flooding and landslides frequently made the road impassable and after the war the vehicular route was conceded to the jungle and no longer maintained. Up to this day, it is still the only vehicular road that has ever been constructed across the mountainous spine of Papua New Guinea. Today, many sections of the vehicular road are claimed back by the jungle and derelict, but the track is still used regularly by locals. Due to mining activities in Hidden Valley, the original Bulldog Road cannot be walked between Yanina and Wau anymore. Instead, the walking trail now follows the original Donkey Track to Kudjeru. One of the last trekkers to walk the Edie Creek route before it was closed off was Richard Stanaway, who walked north to south in 2001. See his trip notes here. Nowadays it takes 4 – 8 days to walk the track in either direction following the original supply route. The stretches between Niukeva and Yanina are relatively easy walking along surviving sectors of the 1943 Bulldog Road. Between Yanina and Kudjeru you’ll have to tackle challenging, steep ridges on narrow foot-tracks over slippery roots and logs. The stretch from Kudjeru to Winima is easy again, following rolling hills with scenic views. There is an all-weather road connecting Winima to Wau. To get to or from Niukeva, you need to take a boat up, or raft down, the Lakekamu River. Many tour operators out there offer guided tours of the bulldog track for tremendous amounts of money. In our opinion doing the Bulldog Track with an organized tour is not only unnecessary but also kills the adventure spirit and hampers real contact to the locals. If you want to tackle the Bulldog Track on your own, check out our Adventure Package. It’ll set you up with everything from general information to a detailed track description and a fully walked GPS track of the whole trail.